Well I pulled off the 10-people dinner party rather successfully, I must say. The Christmas tree provided very nice lighting and ambiance. My friend Yvonne brought the most amazing cheese (Vacherin Mont d'Or, supposedly available only once a year from a specific Swiss region) that the guests continued to rave about a week later. Mike was, of course, in charge of the drinks. He managed to give so much booze out that everyone was drinking water by the end of the night. I was way too tired to bother taking pictures. 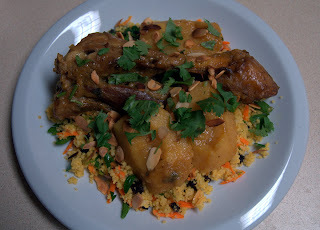 But here's an old picture of the Moroccan Lamb dish with couscous exactly how they were served. The recipe was, you guessed it, from Martha's magazine. The addition of saffron gave the dish an exotic edge, and the lamb was cooked to falling off the bones. In my opinion, the shank was such an amazing cut because all the connected tissue becomes a soggy sticky mess that creates a great mouth feel. The high-pectin content in quinces thickened the sauce very nicely, and it is a welcomed change from the usual starch-based thickening agents (flour, corn starch, etc.). The pear-apple fragrance from the quinces complimented the lamb very well. Imagine, a good lamb stew without red wine or stock! Meanwhile, bring 4 cups of water with lemon juice to a boil. Add quinces and cover with parchment paper. Cook for ~40 min. Drain, remove seeds. Puree half of them. Take out lamb and reduce liquid by about half, for 20 min. Skim fat. Add back in lamb, pureed quinces and whole quinces. Cook for another 20-25 minutes. Serve by topping with cilantro and almonds.